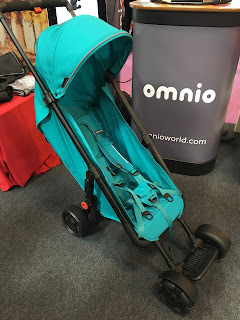 A couple of weeks ago, we were kindly invited to The Gadget Show Live to preview the newest stroller on the block, Omnio. The Omnio is a stroller that thinks it's a backpack. 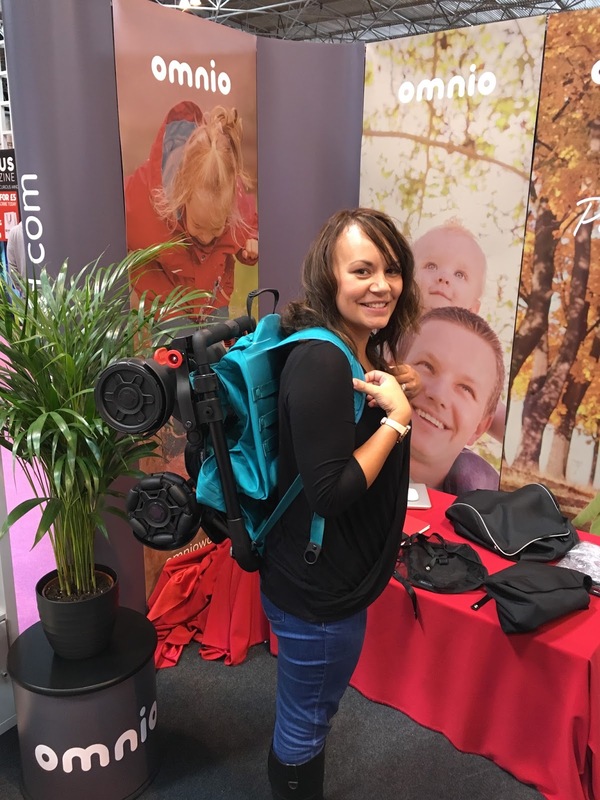 To put it simply it easily folds down into a wearable product making it ideal for adventure and travel loving families. It is perfect for families who are always on the move. 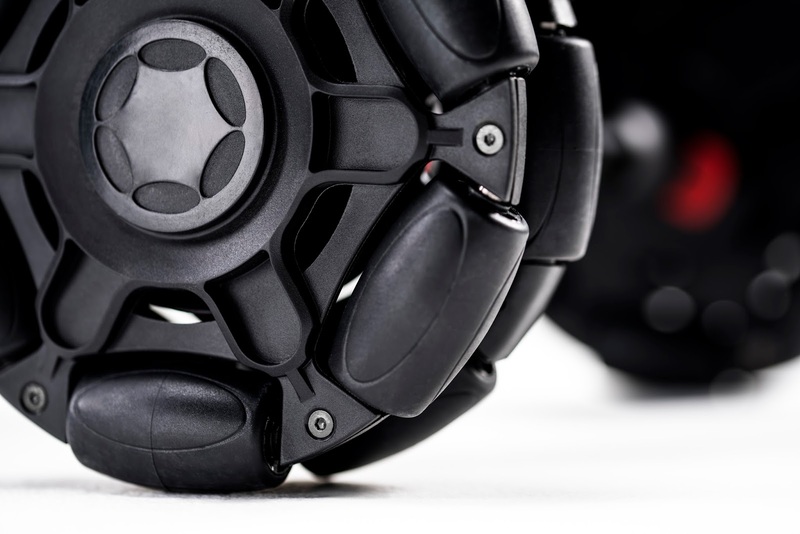 The stroller has been designed for ages 6 months old to a maximum weight of 22kg. I was instantly drawn to it's design. 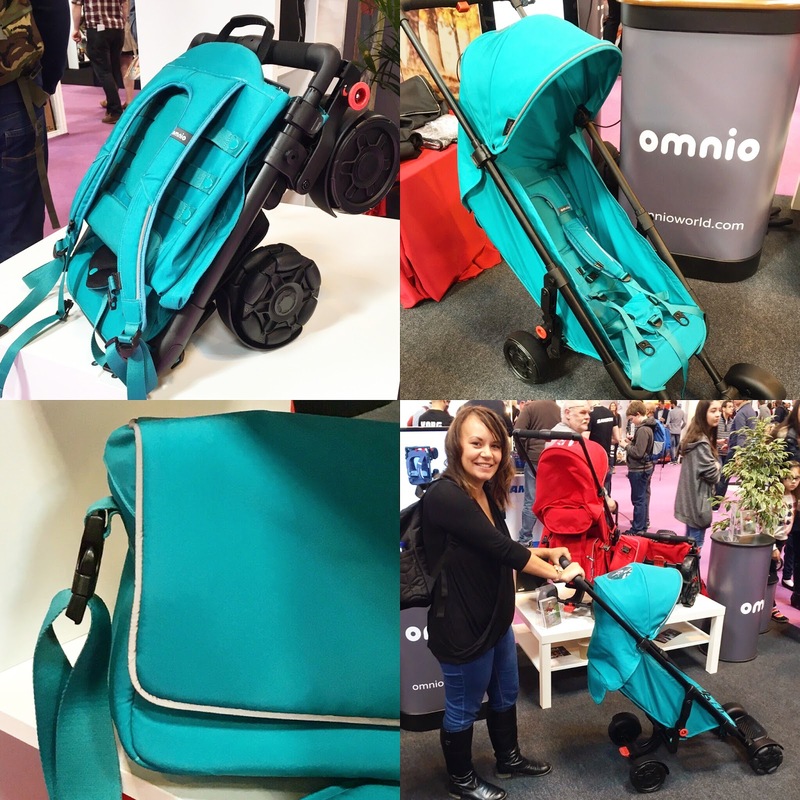 I think it's a very smart, modern looking stroller which is available in 3 colours - black, red and a fab turquoise colour (which was my personal favourite). 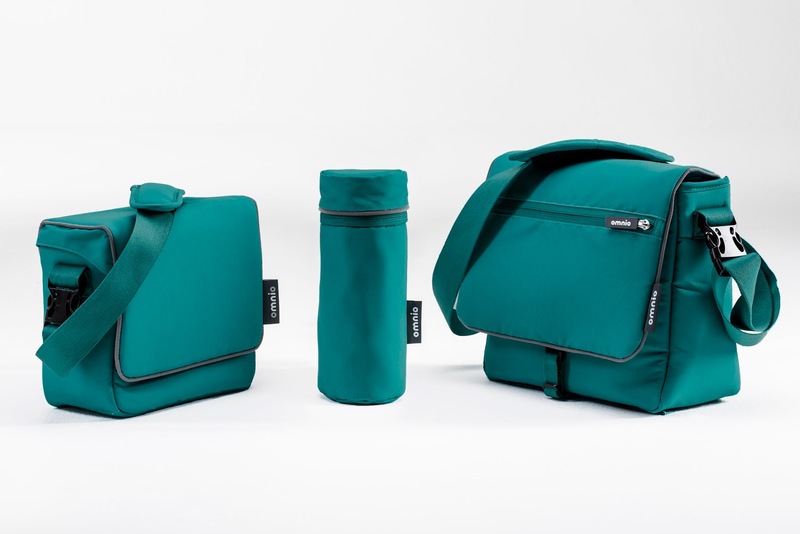 You will also be able to purchase some matching accessories which are a changing bag, insulated bottle bag and a stroller bag. All can be cleverly fitted to the stroller which is a dream come true for any parent. The less we have to carry the better. The stroller comes with a fully detachable rain cover and sun hood to suit all weather conditions. Hubby being the engineer that he is was immediately drawn to the wheels of the stroller and noticed that they were different to the norm. They have a series of curved rollers which means the wheel can not only spin but it can roll sideways. If i'm honest this technical explanation went over my head but what I will say is that when I had a go at pushing the stroller it handled extremely well. It was incredibly lightweight and agile and easily moved whichever way you wanted it to go. They are also puncture proof which is great for all terrain surfaces. 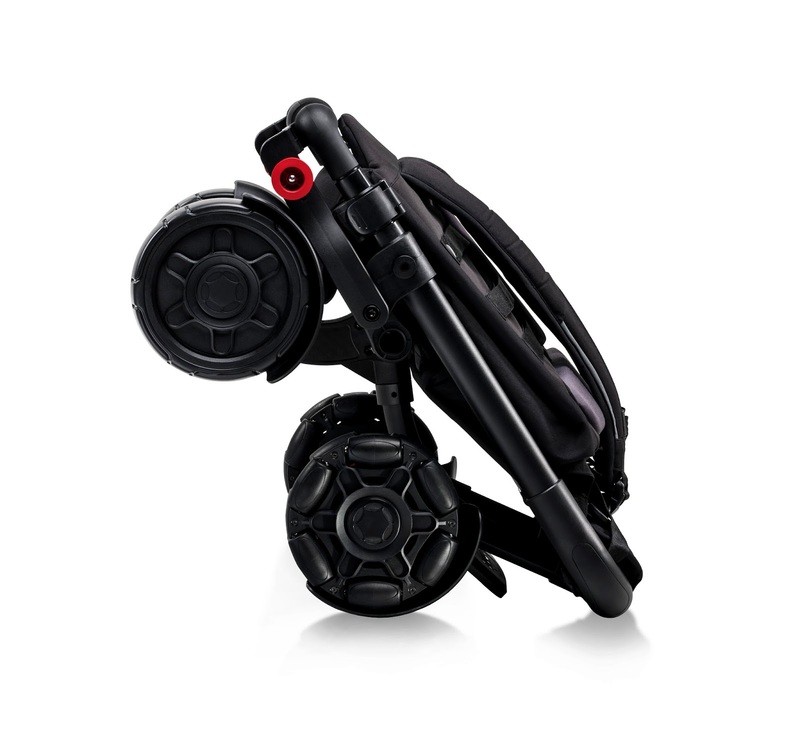 The stroller easily folds down into a backpack which you can then carry leaving you hands free to attend to your child. This is such a great feature as I can't begin to tell you how many times Eva used to want to get out of her stroller when she could walk, leaving me to battle with looking after her whilst pushing the stroller at the same time. This feature is also ideal for all types of travel. I imagine it would be very useful on train and tube journeys. It's also handy for plane travel. As much as i've always wanted Eva to stay in her stroller around an airport, the excitement is always too much for her and she has to run about, once again leaving me pushing the stroller and trying desperately to multi task. When the stroller is on your back it isn't too heavy. No heavier than carrying a change bag. The size of it folded down, has a great appeal to me. It folds to 53 x 41 x 28cm. We actually had to change our car when we first had Eva as we couldn't get any pushchair to fit in the boot. It will be able to be stored away neatly in a cupboard, under a desk or in a boot without taking up too much room. This looks fab I'd so love a pram like this. Wow, that's really handy to have, especially when travelling. When my daughter was just a few months old, we went back home to the Phil for a visit and brought our very heavy silver cross buggy. And I hated it! Now if only we had something like that when my daughter was younger. This is definitely something I'd want to have. Dean of Little Steps. I can't believe it's puncture proof,how good is that!!! This is the coolest stroller I have ever seen I think it is awesome that it converts into a backpack and is puncture proof. What a fantastic invention, I've never seen it before, so thank you for sharing. It's perfect for London as there are so many stairs on the underground! Oh wow I think this is a great idea - when we travelled to Helsinki recently for the week I just took a sling but wish I had had enough space for a buggy or stroller and this would of been perfect! What a fantastic product!!! I'm actually so impressed, i need one of these in my life because my boy is at an age where he's big enough to walk for little stretches but not if i'm going to be shopping or out all day. Love it, great post! what a lovely invention, I think this will totally be welcome for many parents out there. Omg that's so handy when you travel. It looks quite comfy to sit in too for a stroller. This looks brilliant - what a fantastic idea. We would have loved to use this when ours were small. And glad to read that it works well as well as being so practical to carry around. I have to say I think it is genius! It wouldnt be so popular on the tube here at rush hour, but how amazing!